Support our dog’s Hebrew education! Students Give the Gift of Sight to Israeli Blind Students are urged to help sponsor a puppy, either as a class Tzedakah Project, or as a Mitzvah Project for their Bar or Bat Mitzvah, to assist blind Israeli veterans and civilians in regaining their lives. Millions of Israelis depend on MDA’s fast response. And we’re depending on you. Scripps Welcomes D I N A FA I N M A N , M D Dr. Fainman specializes in general obstetrics and gynecology, birth control options, pregnancy care and childbirth, minimally invasive gynecologic surgery, and hormone replacement therapy and menopause. She speaks English, Spanish and Hebrew. Scripps Clinic, Encinitas 310 Santa Fe Drive, Suite 204 Encinitas, CA 92024 Call 760-633-7245 to schedule an appointment or visit Scripps.org for more information. Let us take care of the driving, so you can sit back and enjoy the ride. On the Go is a program of Charitable Adult Rides and Services (CARS) and is operated by Jewish Family Service of San Diego. Your donation to Jewish National Fund helps build Israel for the next generation to call home. Playground in Northern Israel built by JNF. San Diego Opera presents Verdi’s masterpiece “Rigoletto” February 2, 5, 8 and 10. Professional theatre at its best! A MUSICAL CELEBRATION! Twenty Performers Take You on a Thrilling Musical Journey through the Best of LAMB’S 25 Years in Coronado! Kate Abbruzzese, Matt Schwader, Helen Carey, Christian Conn, and Helen Cespedes “The Importance of Being Earnest” at the Old Gobe. Founder of Bubbe & Zayde’s, Bonnie Curkin Ph.D, Resident David Jadwin, Atty. Seth Curkin, Shimon Cagab Adm and Resident Rochelee Geiman (Tarbut V’Torah). he look of guilt, worry and concern often cover the face of a son or daughter bringing their elderly parent to a care facility. Where is your Jewish GPS taking you? The only dually aﬃlated synagogue in California. he Merage Jewish Community Center of Orange County will host the Jr. Maccabi Games this June. The games, which comprise art, basketball, dance, journalism, musical theater, soccer, swimming and tennis, will be held on June 9. Children aged eight to 11 are invited to compete and all sports except for basketball are co-ed and will be offered in 12U and 10U competitions. The competition is open to athletes from the JCCs of Orange County, Long Beach, Los Angeles and nearby. Players ages six to seven can participate in a “Taste of Maccabi” multi-sport program. The games will be covered by “Star Reporters” for the Jr. Maccabi Times. The JCC Maccabi Games and ArtsFest is the largest Jewish youth event in the world, bringing together thousands of Jewish teens for friendly competition. Pointe, where you will find unparalleled Independent, Assisted, and Memory Care services for seniors, while incorporating Jewish traditions and lifestyles. For over 30 years, Heritage Pointe has offered a safe and secure living environment, where Residents can live life to its fullest surrounded by well-trained and compassionate caregivers. Why be one in a million? ...when you can be one in a MINYAN? Beth Jacob Congregation of Irvine offers 3 daily services 365 days a year. Drop in and say Kaddish and/or drop in a just say “CHAI”, either way you will be glad you did. Join us for a Gourmet Kiddush every Shabbat (Saturday) Morning with Catering by Nina. n B’nai Israel Congregation Experience the depth, feel the joy! A nonprofit information resource raising awareness about Jewish and general population conditions and educating the public about the importance of preconception genetic carrier screening. The Golden Dreidle 2626 Dupont Drive, Suite 40 Irvine, CA 92612 (949) 955-0900 goldendreidle.com *Please call individual synagogues for information about their gift shops. he 30th Annual Palm Springs International Film Festival (PSIFF) opened an innovative section for Jewish cinema with the inauguration of New Jewish Stories, which Michael Lerman, the festival’s creative director refers to as “contemporary Jewish cinema at its finest.” Ten films were added to this year’s festival because of this new category, a wise decision as it catapulted a remarkable documentary, “Who Will Write Our History” into the limelight. The 90-minute documentary, directed by Roberta Grossman, revealed secret eyewitness accounts of life in Poland’s notorious Warsaw Ghetto during WWII where 450,000 Jews were sealed into an area of 1.3 square miles between 1941 and May, 1943. FROM MY KOSHER JERUSALEM KITCHEN by Sybil Kaplan Sybil Kaplan is a journalist, author, compiler/editor of nine kosher cookbooks and food writer for North American Jewish publications, who lives in Jerusalem where she leads weekly walks of the Jewish food market, Machaneh Yehudah, in English. 1. Preheat oven to 325° F. Prepare two 9-inch cake pans. 2. In a large bowl, whisk flour, sugar, baking soda, salt and spices. Form well in the center. 3. Add oil, eggs, milk, honey and vanilla. Whisk until moistened. Fold in apples. Spoon half into each baking pan. 4. Bake in preheated 325° F. oven about 45 minutes or until a tester inserted into the center comes out clean. Cool. 1. Beat cream cheese and margarine in a bowl until fluffy. 2. Add sugar, vanilla and orange peel. Add honey and beat until smooth. 3. Chill. 4. Place 1 cake flat side up on a serving dish. Spread with 1 cup frosting. Top with second layer, flat side down. Spread remaining frosting on top and sides of cake. Images by Jordan D. Schnitzer Family Foundation. 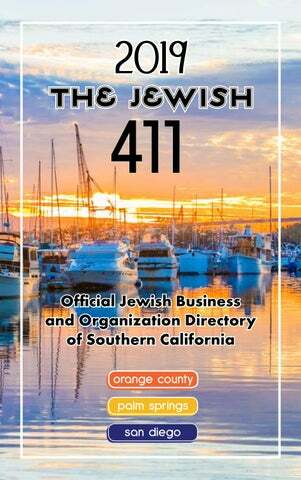 THE JEWISH 411 of Rancho Mirage also place orders for community members with kosher caterers and bakers in San Diego and Los Angeles, who deliver to the Palm Springs area. Albertson’s and Clark’s Nutrition of Rancho Mirage; Jensen’s Finest Foods, Ralphs and Trader Joe’s of Palm Springs; and Trader Joe’s of Palm Desert all carry kosher items. 4275 Executive Square Suite 400 La Jolla, CA 92037 (858) 202-2366 Direct (858) 922-1415 Cell tfrank@financialguide.com Life Insurance. Disability Income Insurance. Long Term Care Insurance. A Place of Family & Torah Shabbat Dinner • Zimra Service AAPlace of Torah Religious School • Youth Groups Place of Family Family &&Torah Shabbat Dinner • Zimra Service Tikvah Preschool • Tot Shabbat Shabbat Dinner • Zimra Service Religious School • Youth YouthGroups Groups Torah Study • Hebrew Classes Religious School • Tikvah Preschool • Tot Shabbat Tikvah Preschool • Tot with Shabbat Adult Education Classes Rabbi TorahStudy Study • • Hebrew Hebrew Classes Torah Classes Havurah Groups AdultEducation Education Classes with Adult Classes withRabbi Rabbi Yiddish Club & more! Havurah Groups Havurah Groups Yiddish Club & more! Yiddish Club & more! Students are urged to help sponsor a puppy, either as a class Tzedakah Project, or as a Mitzvah Project for their Bar or Bat Mitzvah, to assist blind Israeli veterans and civilians in regaining their lives. Welcome to the Seacrest Family! From the stunning coastal views of Encinitas to the beautiful rolling hills at Rancho Bernardo, to the comfort of your own home, our Seacrest family welcomes you. An exquisite, newly-renovated independent living community nestled in the rolling hills of Rancho Bernardo and Poway. Relax and enjoy each day, living, learning and laughing with friends. Ask about our Concierge Care Program for independent seniors. Get peace of mind knowing your loved one will be cared for with a professional, compassionate Caregiver! We offe 2-hour r minimum s! hen I joined the JCC two years ago, I didn’t really know what to expect. I came in for an introductory personal training session with Taylor and the rest is history. Before I knew it, I was training and attending six group fitness classes a week! Next thing I knew, I signed up for San Diego Center for Jewish Culture classes, attended the San Diego Jewish Film Festival and more. What keeps me here though? The atmosphere. Like they say, there’s just something about this place…from the welcoming and supportive staff, the melting pot of generations, to the giggling preschoolers walking down the hall…it’s so hard to find a community in this crazy world, but I found mine here at the Lawrence Family JCC. Alina Levy, member since 2016. Whether you’re concerned about a loved one or coping with the symptoms of dementia on your own, we’re here for you and your family. COASTAL CHABADS OFFER YOU & YOUR FAMILY? We are here for you! We are here for your Jewish needs! We want to hear from YOU! Serving Carlsbad & Encinitas with a Smile Since ’89! 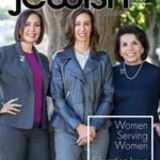 or more than 50 years, the Jewish Community Foundation (JCF) of San Diego has been a major resource, helping to match the philanthropic passions of donors with a wide range of grantees in our community and around the world. We believe that every individual has the power to make a difference and together we can change the world. The Foundation continues to engage, educate and inspire generations of givers throughout our community. During oneâ&#x20AC;&#x2122;s lifetime, a Donor Advised Fund (DAF) held at the foundation affords you the convenience of managing your philanthropy through one central account. Gifts made into your fund are potentially tax-deductible and money can be granted out of your fund to support any 501(c)(3) charitable organization. Balances are invested in professionally managed investment pools with the potential to grow. The Foundation accepts a wide range of gifts to fund accounts, including appreciated securities, non-cash assets such as real estate and even interests in closely-held businesses. C (NY, NY 212-554-1234), member FINRA, SIPC. ough AXA Network, LLC, which doesbusiness in CA nia, LLC, in UT as AXA Network Insurance Agency of Agency of Texas, Inc., and in PR as AXA Network of twork do not provide tax or legal advice. Certified . owns the certification marks CFP®, CERTIFIED ered CFP (with flame design) in the U.S. Midwest by AXA Advisors or AXA Network. Moving Forward Together For support through tough times For help caring for an older loved one For guidance in reaching long-term goals For a stronger, more connected community With compassionate and integrative services, Jewish Family Service is here for you. Weâ&#x20AC;&#x2122;re committed to helping people in crisis move forward, while developing innovative strategies to break cycles of poverty and strengthen our whole community. Building community through spiritual opportunities, personal connections, and meaningful engagement. Infant Center • Preschool Torah School • Youth Groups Shabbat and Holiday Services and Activities Education, Social, and Social Action Programs Sisterhood • Men’s Club and More. *Please call individual synagogues for information about their gift shops. Jewish Federation of San Diego County We care. We help Jews in need and we build community. It’s that simple. 018 brought its share of the unexpected. Be it Hurricane Florence, the worst wildfires in California history or flaming kites and balloons launched into Southern Israel, you helped us provide emergency aid, trauma counseling, nutrition programs and wellness programs. Federation was there when our community needed us most. Because we are always there. Is the Housing Market Shifting to Favor Buyers? Call JOEL Today and Find out! Support our dog’s Hebrew education! Students Give the Gift of Sight to Israeli Blind Students are urged to help sponsor a puppy, either as a class Tzedakah Project, or as a Mitzvah Project for their Bar or Bat Mitzvah, to assist blind Israeli veterans and civilians in regaining their lives. Young Israel Congregation of San Diego is a member of Young Israel family of Synagogues. We strive to provide our members and visitors with a meaningful and inspiring prayer and Torah learning environment. METRO FLOORING has over fifty years of successful experience in the flooring industry! We offer the most complete selection of carpet, natural stone, tile, wood, vinyl, and window coverings in San Diego. Together the family at Metro Flooring understands one thing better than anyone else, and that is SERVICE. We believe that customer service is the key to our operation, and we will do anything to please our customers. warm, inclusive caring community Give to your heart’s content. Support the future of Beth Israel. LiveUp at the JCC with Les Mills classes! The Del Cerro Mission is to present the San Diego Jewish population with the comfort of quality living and care in a restful and secure space where Jewish residents of nearly all levels of care and observance will feel welcome. At Pacific Bay Recovery, we specialize in compassionate treatment and personalized rehabilitation for individuals struggling from substance abuse disorders and/or chronic pain. With our assistance, you can take back your life! Michael S. Duffy, D.O.-Medical Director 858-263-9700 www.pacificbayrecovery.com Lic # 370136AP. 7 Convenient Locations Why go anywhere else? INVESTING \ BANKING \ TRUST & ESTATE SERVICES \ WEALTH PLANNING \ FAMILY OFFICE Member FDIC. Â© 2019 Northern Trust Corporation. Southern California listings for everything from synagogues to theaters and Jewish community centers to delis.